DBBL SSC Scholarship Result 2018. 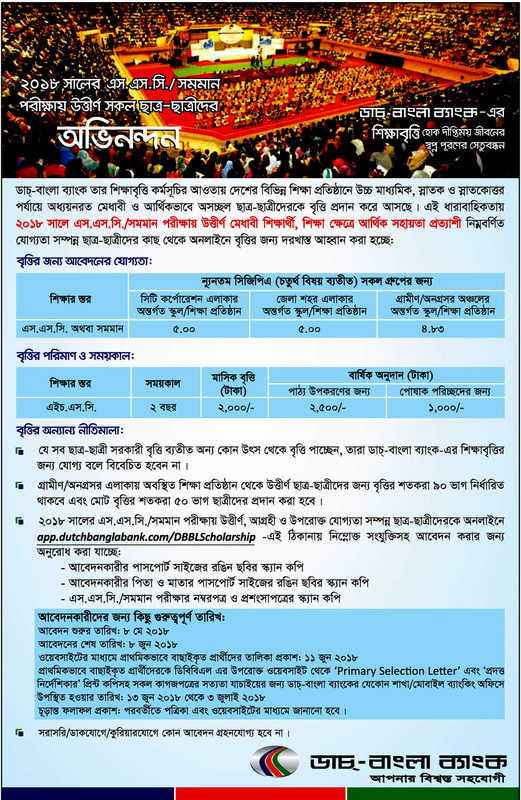 Dutch-Bangla Bank SSC Scholarship 2016 circular announces for the SSC Pass Students in Bangladesh Scholarship Program 2018. Dutch-Bangla Bank SSC Scholarship 2018 circular related all information is available my website. So eligible Students are requested to apply through online for the positions. To know more details please see the original Job Circular. The last date of applies for positions 8th June 2018. DBBL SSC Scholarship Result 2018. ■ Students must have GPA 4.5 without 4th subject under rural area. The application form is available all DBBL branch, form fill up and four copy passport size photograph, mark sheet with attested by 1st class graduated officer and school headmaster yearly income certificate. Without city corporation quota 90% scholarship and also 50% girls this program. Those who are selected for DBBL Scholarship SSC-2018 they must be admitted HSC level. Only shortlisted candidates will be called for the interview as per recruitment process.Any kind of persuasion/canvassing in any stage of selection process shall be treated as disqualification. Dutch-Bangla Bank Limited reserves the right to accept or reject any application without any reason whatsoever. DBBL SSC Scholarship Result 2018.